Later this spring, fans can catch Los Angeles based hip-hop/metal veterans Hollywood Undead at Monster Energy Welcome To Rockville in Jacksonville, FL on April 25 and Rock On The Range in Columbus, OH in mid-May. In the meantime, the band is premiering their video for “Day of the Dead” at www.WelcomeToRockvilleFestival.com and www.RockOnTheRange.com. 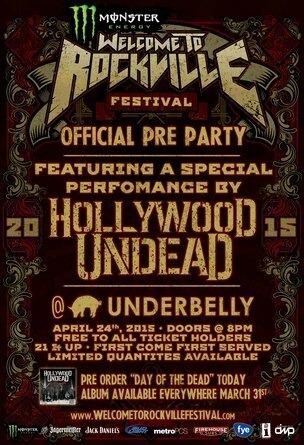 Hollywood Undead will get the party started Friday, April 24 with an exclusive performance at the Monster Energy Welcome To Rockville Official Pre-Party at Underbelly (113 E Bay Street) in downtown Jacksonville. The Monster Energy Welcome To Rockville Official Pre-Party is presented by Danny Wimmer Presents, Bud Light, Jack Daniel’s and Jägermeister. The party is free to all Monster Energy Welcome To Rockville ticket holders 21 and older. To gain access to the Pre-Party, ticketholders need to show their festival ticket at the Underbelly box office to get a Pre-Party wristband in advance. Wristbands are limited and will be distributed on a first come, first served basis beginning at Noon on Friday, April 24. Doors open at 8:00 PM for the Pre-Party and music starts at 9:00 PM. Monster Energy Welcome To Rockville and Rock On The Range are part of the World’s Loudest Month festival series. Created by AEG Live, Danny Wimmer Presents and RockHouse Presents, The World’s Loudest Month features the biggest names in rock music performing in eight distinct U.S. concert atmospheres in April and May. Last year saw new attendance highs for the World’s Loudest Month festivals, with more than 368,000 fans turning out to see over 150 bands perform, proving that the hunger for rock and metal music in America is growing.